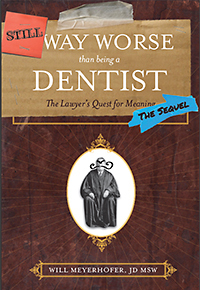 I have written four books: Life is a Brief Opportunity for Joy, Way Worse the Being a Dentist, Bad Therapist: A Romance, and my newest book Still Way Worse than Being a Dentist, the Sequel. Please click on one of the book jackets for more information on each book. My latest book, published in 2016, is a sequel to the best-selling Way Worse Than Being a Dentist. The follow up volume is imaginatively titled “Still Way Worse Than Being a Dentist” and it takes off where the first volume started. If you loved volume one…well, everyone loves a sequel. 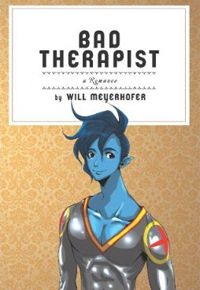 Bad Therapist: A Romance, is a playful comic novel recounting a romance between a mild-mannered New York City psychotherapist and a blue alien from outer space. It is best described as sui generis – but if you have a sense of humor about psychotherapy and a curiosity about what it might feel like to be sitting in that other chair… this might be for you. 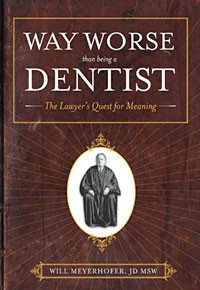 My second book, Way Worse Than Being a Dentist: the Lawyer’s Quest for Meaning, was published in late 2011. This book grew out of my experiences as a corporate attorney at Sullivan & Cromwell back in the late 1990’s. I was asked, back in early 2010, to write a column about law and psychotherapy for the popular legal website, AboveTheLaw.com and those columns – dozens of them – became the starting point for a book that tackles the current unfortunate state of the legal profession. Way Worse is funny – and deadly serious. It deals with the entire lawyer experience, from contemplating law school to making partner. A must for anyone considering a legal career – or already working in the legal profession and wondering how matters devolved into their current pickle. Also helpful if you just know someone working in law and desire a clear-headed view into that strange and unique world. 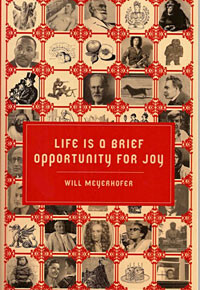 My first book, Life is a Brief Opportunity for Joy, was published in 2010. It is intended as an introduction to the sort of psychotherapy I practice, and arose from my desire to create a brief text to prepare my clients for the work we do together – in other words, to get them thinking like a therapist. It makes an excellent introduction to anyone curious about psychotherapy, how it really works, and its philosophical and scientific underpinnings. © 2019 A Quiet Room. All rights reserved.